You are here: Home > Here, there and everywhere! 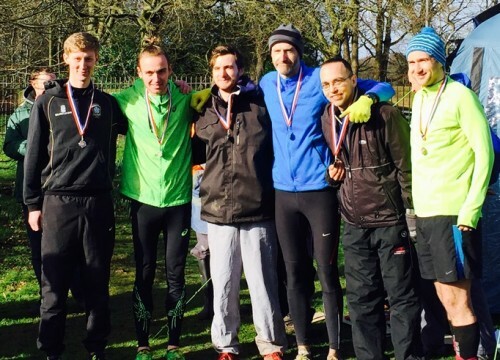 It was a weekend where Liverpool Pembroke Sefton athletes were literally everywhere. Southport Waterloo or Wirral. LPS were silver medallists last year but absences made them look vulnerable on this occasion. However, the rapidly improving Aaron Jarvis took off with the leading group and was only dislodged from an individual medal as the race progressed. He finished an excellent fifth and eyes switched to the next counters. Sean Kirkbride(12) and Richard Weeks(13) had a tremendous battle to the line and veteran Sammy Rashid produced another stunning run on 21st. Things were looking up. Mark Wynne(32) was clearly unfit but bravely fought to the end. There was then a worrying gap to the fighting figure of Danny Gilbody(49) but other teams were experiencing similar problems closing in. In an exciting finale a joyful LPS squad stole the silver medals once more from Southport Waterloo. The back up boys were, Chris Pedder(62), John Halson(64), Robbie Wood(74), Ethan Dalton(85), Andrew Conway(101) and the amazing 69 year old John Dobie(126). The schools were also having their championships. The Merseyside at Arrowe Park saw Dan Slater(Sefton) comfortably take the Intermediate Boys title and Rosie Johnson(St Helens) the Senior Girls. Joe Houghton was an excellent second in the Junior Boys race and part of the bronze medal St Helens team. Sefton had a good day their Year 7 girls taking gold with Emily Brough(5), Gabby Morris(7) and Faye Hannaway(12) in the squad. Jenny Williamson(10) and Beth Billington (19) were part of their Junior Girls silver team and Morag Molyneux(13) and Corinne Molyneux(20) the Intermediate Girls bronze. To the Lancashires at Witton Park where locals were either representing West Lancs or Chorley. Anna Hulme was 4th in the Senior Girls and there were no fewer than 5 LPS members in the Intermediate Girls led by Harriet Foley(20). West Lancs took the bronze. Dan Jones was an excellent third in the Intermediate Boys with brother Adam ninth. Again there were several other locals present and together they collected silver. The Junior Girls had the first four for West Lancs led by Fran Price(14). Year 7 had Grace Mitchell and Martin Russo(9). To round up the cross country the University Championships were at Gloucester and Alistair Nelson(Nottingham) was on 112 just ahead of James Loftus(Liverpool) who was 121. The Northern U15 and U13 Indoor Championships were at Sheffield. At Under 15 in the High Jump Owen Southern sailed to a magnificent 1.70m and collect the silver medal on the count-back. Another tribute to the club`s fine High Jump group. There were no other medals but some excellent performances including personal bests from U15 Sadie McNulty(1.45m) in the High Jump and a clutch who tackled the Long Jump including Sadie(4.76m) seventh in the Final, Erin Birchall( 4.70m) ninth in the Final and also Lauren Lewis( 4.64m), Alice Prescott(4.45m) and Scarlet Whitfield(3.79m). Alice Prescott sprinted to 27.95 in the heats of the 200m as did Sam Latimer with 27.38. In the heats of the 60m Alice Prescott posted 8.88, Lauren Lewis 8.31, and Erin Birchall 8.56.Lauren went through to the semi-final where she ran 8.39. That wasn`t the end of an exciting weekend. Heavy winds plagued the Dog 10K Road Race at Southport but Kirsty Longley(38.45), 22nd overall, came through to take the first female prize. Greg Callaghan(23rd in 38.55) and Matt Thompson(24th in 38.57) ran with her.